Drone footage shows what Greenpeace did to Peru's Nazca Site. 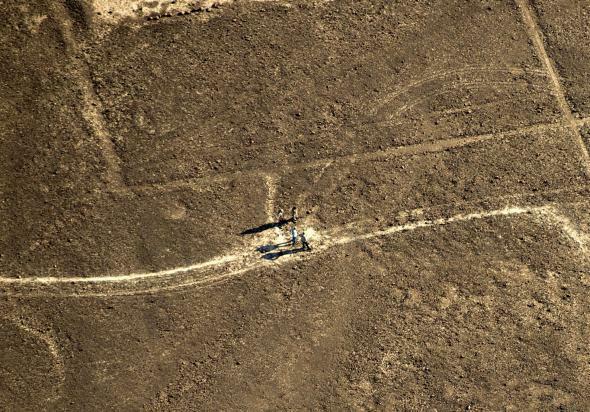 The National Culture Institute of Peru evaluated damage at the Nazca Lines on Friday. Last week, amid the United Nations’ climate talks in Lima, Peru, members of Greenpeace made a serious pro-sustainability statement. They arranged huge yellow letters to form the message “Time for change! The future is renewable. Greenpeace.” But they did it on the Nazca Lines World Heritage Site, an area that is restricted to preserve delicate, 1,500-year-old drawings of animals in the soil. Greenpeace has apologized for the damage it did and said that it won’t use images from the campaign in future promotions. PBS NewsHour, working with the Culture Ministry of Peru, got access to the first drone footage assessing the impact on the Nazca Lines from the air. And … it doesn’t look great. These things were damaged, they have to be returned to their original status. Some people will have to face criminal charges, because that is unavoidable and the process has already started. … When you step on [the surface] you simply break the patina and expose the bottom surface. How long does it take for the nature to lift again all that sand and expose again and create the patina? Hundreds of years? Thousands of years? We really don’t know. From the drone footage you can see where the Greenpeace letters were laid out and where the activists walked. Standard practice is for experts to wear special pads on their shoes when they examine the Lines, sort of like snow shoes, to distribute their weight and avoid leaving marks like Greenpeace did. According to the Guardian, Castillo has told state media that Peru is considering seeking extradition so the Greenpeace workers can be held accountable.